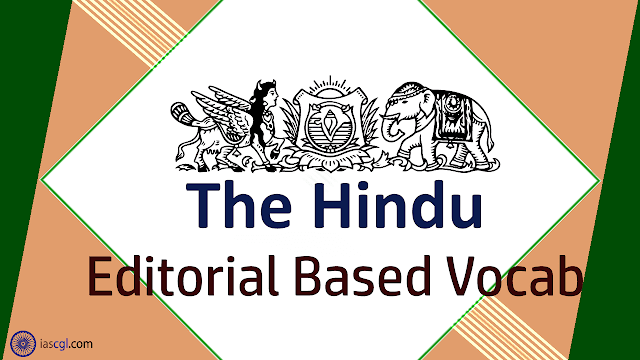 HomeVocabThe Hindu Vocab 20th September 2018 For Competitive Exams. The Hindu Vocab 20th September 2018 For Competitive Exams. Vocabulary from The Hindu Editorial 20th September 2018 for Staff Selection Commission(SSC) Combined Graduate Level, Combined Higher Secondary Level, Bank PO, Clerk and other state Government Examination. Earlier this month, the Supreme Court dismissed the plea filed by Earth Brigade Foundation (EBF) to overturn the order to shoot a five-year-old tigress from Pandharkawada in Maharashtra. This tigress, which is raising two cubs, has been accused of killing — and even eating — more than a dozen people over the last two years. The EBF’s main contention is that all the kills have taken place within designated forest areas or on their periphery. This begs the question, what is the objective? Is it to make forests safe for humans, or for wildlife? This degraded forest is home to spillover tigers from the nearby Tipeshwar Wildlife Sanctuary. Human encroachment is rampant — it disrupts contiguity of the habitat and multiplies the chances of man-animal conflict. The forest has scant food for wild herbivores. Alarmingly, there is heavy pressure of illegal grazing, with livestock consuming a huge proportion of the food and water meant for wildlife. Locals take cattle and goats “on contract” from rich owners to graze them illegally in the forest. The EBF’s case is not to save one tigress, but to keep wild habitats safe for wildlife to ensure their long-term survival. The Forest Department, mandated to preserve forests and their denizens, appears to be apathetic towards the basic tenets of habitat management. Citing human and political pressure, wildlife coming into conflict situations is regularly eliminated. Instead of unequivocally standing up for the forest and its denizens, why choose the path of least resistance by shooting dead a tigress, terming her a “man-eater”? The term “man-eater” is the legacy of the British Raj. However, it is now used whenever it is necessary to scare people, including those who rule on what is just, into demanding the killing of a tiger/leopard involved in a man-animal conflict. The National Tiger Conservation Authority protocols say, “Human beings killed due to chance encounters may also be eaten by the animal [especially an encumbered tigress in low prey base area] … [This is] not sufficient for classifying a tiger/ leopard as a ‘man-eater.’” The Pandharkawada situation is a textbook example of this as it involves an encumbered tigress (supporting two cubs), chance encounters (killings in the forest/forest boundary), and bodies consumed in a low prey-base area (the degraded forest). Even when a wild animal needs to be shot dead, the Maharashtra Forest Department seems to prefer to invite a private hunter, Shafat Khan, instead of calling upon personnel from within the government. With the court upholding the shoot order, this tigress, who has done nothing different from any other mother who would kill to protect her children and her home, is paying for it with her life. Raising: पालना; स्थापना - cradle; lift or move to a higher position or level..
Cubs: शावक - the young of a lion, or other carnivorous mammal. Periphery: परिधि - the outer limits or edge of an area or object. Spillover: एक क्षेत्र से दूसरे क्षेत्र तक फैला हुआ - an instance of overflowing or spreading into another area. Encroachment: अतिक्रमण - intrusion on a person's territory, rights, etc..
Contiguity: संस्पर्श - the state of bordering or being in direct contact with something. Habitat: वास - the natural home or environment of an animal, plant, or other organism. Conflict: संघर्ष - a serious disagreement or argument, typically a protracted one. Scant: अल्प - barely sufficient or adequate. Prey: शिकार - an animal that is hunted and killed by another for food.